Have an idea for an event to benefit Dare to Care? Host your own! Please visit this page for details, or contact us for more information. At Northeast Christian Church this Easter, just filling a seat will provide meals for those in need. The Love The ‘Ville church is partnering with Dare to Care and Earth Mission Asia to make a difference in both Louisville, KY and Myanmar. Northeast has pledged to fund eight school pantries for Dare to Care and provide funding to complete a medical facility in a remote area of Myanmar for each seat filled during their eight Easter services. That’s a total of 8,000 seats to fill and up to $100,000 to give – or about four meals and $6.00 per seat. For more details about the Easter Services, click here. On Saturday, May 11th from 10am-4pm, join Lifetime Wealth Strategies (9700 Bunsen Parkway) for an event celebrating 10 great years! Bring friends, kids, dogs, lawn chairs, picnic blankets, and smiles. Food donations for Dare to Care Food Bank will be accepted at the event. For additional details and event schedule, click here or visit the event website. Metallica is calling on their fans to help end hunger by volunteering on Wednesday, May 22 at 50 food banks across the nation, including Dare to Care! Volunteer shifts are 9-11:30am or 1-3pm. Space is limited. Please register by May 8 by following this link. For every six-pack of the Pay it Forward Cocoa Porter sold in our region, West Sixth Brewery will donate at least 50 cents to Dare to Care Food Bank! For details about the program, please click here. 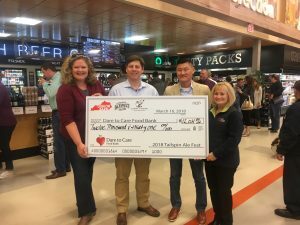 From March-May 2019, local State Farm Agent Ryan Fetsch will be supporting Dare to Care. For every person who completes an auto quote, State Farm will make a $10 donation to Dare to Care. Be sure to mention Quotes for Good and Dare to Care in order for the quote to qualify. Click here for additional details and contact information. When you sign up for Amazon Smile, Amazon will donate 0.5% of your eligible Amazon Smile purchases to Dare to Care. To get started and to select Dare to Care, click here.